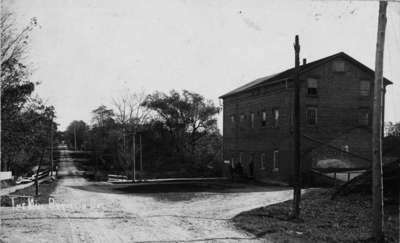 A black and white photograph of the Brooklin Mill. The Brooklin Mill was built in 1848 by Robert Campbell. The view in this photo looks east on Mill Street (Cassels Road). The Mill was located at 25 Cassels Road East, Brooklin. Lower Right: "The Mill, Brooklin, Ont."